Cannon Design partnered with the International School of Indiana to create a space that would support and facilitate the core values of the institution. With the International Baccalaureate (IB) curriculum as the school’s backbone, the space’s intent was to create physical collisions of disciplines. To further define a collection of design drivers, the design team led a series of workshops with ISI students, faculty, staff and parents. The 79 ideas of The Third Teacher provided a common language that enabled collaboration between the learning community and the architectural team. The workshop groups selected the following Third Teacher principles as their focus: "do no harm," "let the sunshine in," "imagine like a child," "build a nest," "dream big and be brave," "make it feel good," and "put theory into practice." 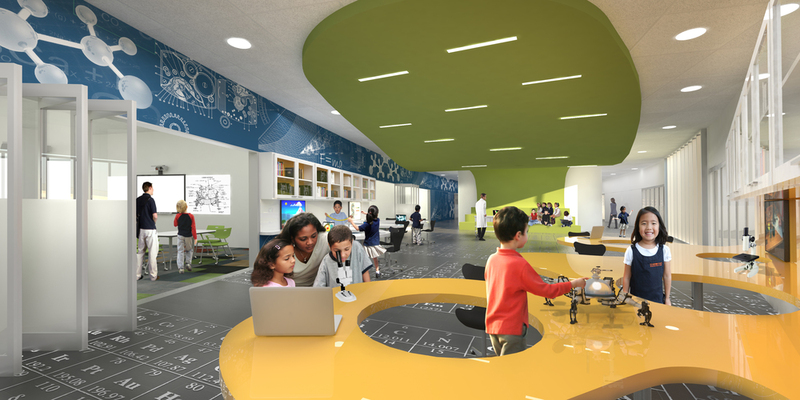 These ideas became the key elements that guided the design of ISI’s ideal learning space. How might we design a unified campus that inspires global learners?